Bobby Dorn (holding his award) of Johnston is now in the Drivers Hall of Fame, an honor that has come his way because he has never had a wreck or gotten a ticket -- to name one pertinent achievement. He has been driving a truck for 35 years, a total of 3.1 million miles, enough to have gone around the world 140 time, and has never had a wreck, never gotten a ticket or points off his license! That is enough to make any man eligible for an award. 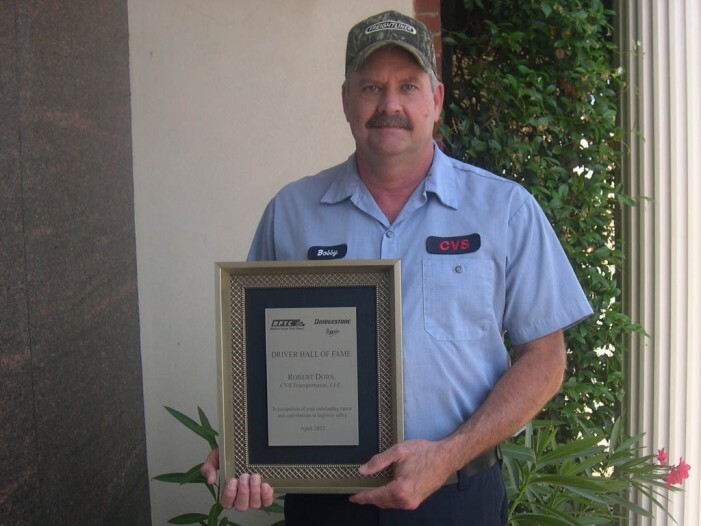 That is one reason the NPTC (National Private Truck Council) chose to honor Robert Dorn of Johnston with choosing him for the NPTC Driver Hall of Fame. This was in late April of this year. What makes such an outstanding employee? His wife Carla stated that out of the four men chosen to go into the Hall of Fame, “They are all active in their churches and are believers,” which was announced by the NPTC. That speaks to the good character that must be basic to these men. But we hear also that he has always had an unusual liking for the truck driving industry – passion for the job, as it may also be called. Bobby says as a very young man he would stand by Highway 25, near his home above Edgefield, and watch the trucks go by and he would dream of driving one, one day. This interest grew with age, and he said with each job he would say how much he would like to drive the lifts (at the packing shed), or moving mechanisms at the saw mills– and he would successfully. Then, he was working at Graniteville Company when he asked to drive a truck. He was 22 and has been driving since, without error. Bobby dropped by, on his way to work on Monday, to bring something to the Advertiser office and it gave us a chance to ask more about his work. For some 28 years he worked away from home, “over-the-road deliveries,” on the road night and day across the country. This was early in his career when he worked for Graniteville and REVCO. REVCO became CVS and he eventually was able to move to driving places on a daily basis – now he comes home every night. (This has been in the last 7 years.) In this daily run routine, a schedule must tell him where he would be going this particular day. He stated: On Monday it is to Georgia; Tuesday to Wilmington, N.C.; Wednesday to Charlotte; Thursday to Raleigh and Friday to Greenville. He was asked about the routes he takes and said he always has a choice. For the last 12 years he is number 1 on the Seniority List; the route is his choice, first. He noted that drives into Georgia are harder because they have more 2-lane roads that he must take. We had lots of questions for Bobby Dorn – about his family and about the problems he has faced on the road, these long years. As for his family, he says his wife took care of the children because he was never home for any of their activities. “She is to be given the credit for the childcare (a son and a daughter, now grown with children).” Not being at home enough was one problem. A second problem he mentioned was lack of sleep. He was given a certain number of hours, by the DOT, to drive somewhere, and there were no hours, or minutes, in the schedule to sleep. He said he could stop the truck and walk around it a time or two to give rid of the sleepiness, and then drive on. (He says he has actually gone to sleep while eating a meal, because of sleep deprivation.) He does not have to do this now. A third problem for him he says – still there – is the loneliness, the being alone so long in the cab of the truck. He says the rules won’t allow someone with you, and he is someone who obeys the rules. There is the fear by DOT that the “guest” will interfere with the driving, making it less safe. When he was “called” to the NPTC conference in Cincinnati, Ohio, in April, he already knew he had been chosen for the Hall of Fame honor. However, he and Carla did not really understand the grandeur that was planned for them. It was Bobby’s very first time to fly on a plane, and they stayed in the historic Hilton of Cincinnati. The food was unbelievably good, they said, being entertained by men on the CEO level. (Bridgestone Firestone financed their trip.) Bobby and Carla described the moment of entry into this large room full of leaders in the organization, the group of honorees being led by bagpipes with the Dorns in the lead, because their name is early in the alphabet. The Dorns felt very honored with the praise and fanfare that came their way. The Dorns are members of Berea Baptist Church, a church that he attended as a child and has continued worshiping in with his family – and is now chairman of the deacon board. Their two children are Kristin Dorn Demmerle, now of Moncks Corner, and Travis Dorn of Johnston. Bobby’s parents are Robert and Nancy Dorn, Sr. And, for history buffs, Bobby Dorn’s great-great-grandfather was William Burkhalter “Billy” Dorn of the gold mine in McCormick. 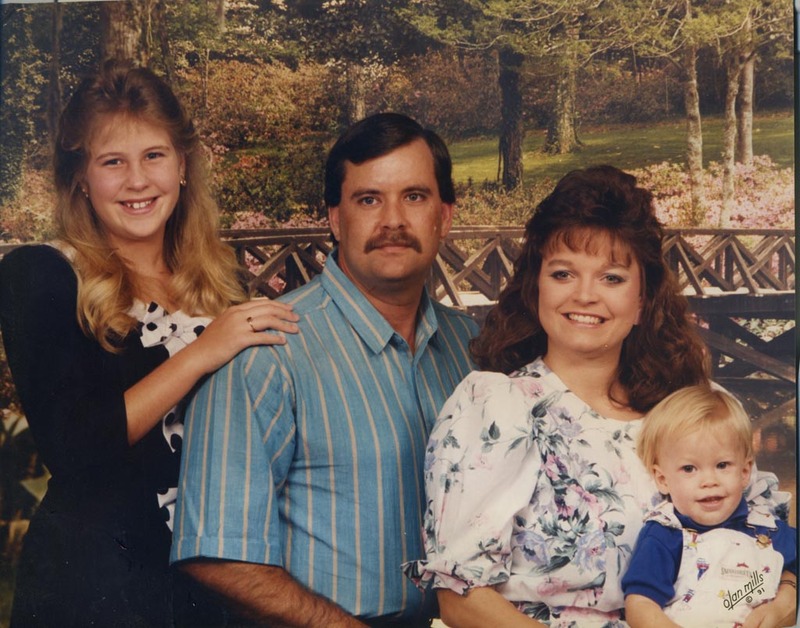 This is Bobby Dorn’s family, in 1992, when he was on the road so much and not at home at nights. Left to right are daughter Kristin, Bobby, wife Carla (originally of Chester) and Travis at about age 2.